On the permission screen you will be able to decide what services you app can access e.g. Storage, photos, contacts, etc. 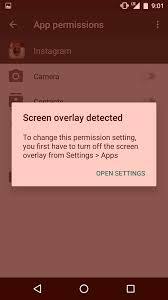 This entry was posted in Life and tagged android, clean master, marshmallow, s6, screen overlay, screen overlay detected by jollof. Bookmark the permalink.